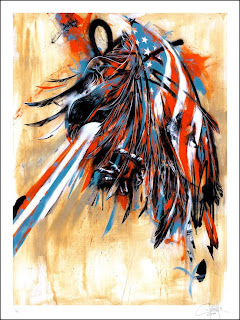 We are big fans of Dave Kinsey's work here at Hookedblog and have spotted he is set to drop his first screenprint of 2010. The "Capital Punishment " print pictured is to be released online later today, 14th January via Black Market gallery in LA. The edition is a 6-color screenprint, on 100% cotton rag and will be an edition of 150. No time mentioned yet as to when it will be available but as they are an LA based gallery I imagine it will available some time this evening for those of you in the UK and interested in this print. Check their website here. Click the image above to see a larger version of the print.